BI tools are often one of the most critical parts of a good growth strategy. The reason is simple: it’s easier to improve when you have good data! If your goal is to grow your business, there’s a good chance you can benefit from BI. This is true whether you own a small business or run a large corporation. If you already use BI tools, make sure you’re utilizing all the features they offer. 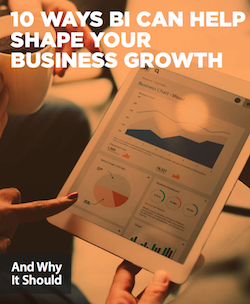 To learn more about BI and business growth, read our guide on the 10 Ways BI Can Help Shape Your Business Growth.